Davis Learning Strategy was introduced in Omega International School by Ms. Moniek Geven in the year 2013. Subsequently in 2014, Model DLS classrooms called ‘Indigo Sections’ were started from Grade I to VII, which made a significant impact on under-performing students, in tasks related to reading and writing. The first batch of 11 students who received instructions through DLS when they were in Grade VII, have been able to successfully complete their Grade X exams; where 10 students scored more than 70% marks. Through our student performance record of last three years, it is evident that all the children in Indigo section improve their learning skills. Attention span, critical thinking and reasoning skills of the students also improve in stress free, nurturing learning environment. This continued progress with our Davis Learning Strategies further prompted us to actively pursue the teaching technique with students in Upper Kindergarten and Primary classes. 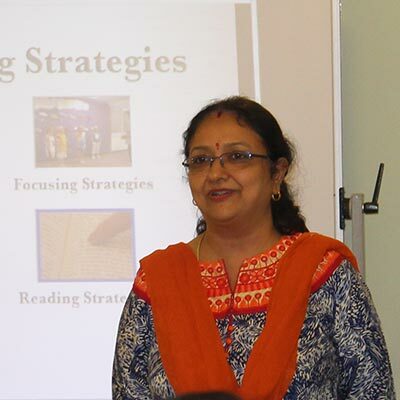 Under the guidance of Ms. Jatinder Kaur and mentorship of Ms. Nirupama Krishnan, the DLS method has been introduced in the classrooms of the Cambridge stream since 2016. Further, one on one Davis counseling sessions are provided to children with Dyslexia, ADHD or ADD by Licensed Davis Facilitators, which has truly benefited the students. The school currently has 115 DLS trained teachers, 3 DLS Mentors and 2 Licensed Davis Facilitators. At Omega International School, we believe that every child has the potential to grow; they only need a nurturing environment, love and support to discover their hidden potential.